The Muhle R41 safety razor has an open comb head, this razor is best suited to experienced safety razor users and or, those with tough, dense beard growth. 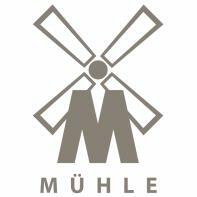 This set is superbly put together by Muhle who are known for the high quality of their goods and their outstanding yet basically fuss free designs. Made in Germany to exacting quality control standards. Barrel style shaving brush with ultra-soft, high grade Silvertip badger hair. The stand has a 60mm footprint and is 70mm tall; it's highly polished and matches the finish on the brush and razor perfectly. Razor: R41 model, 85mm long handle, open tooth comb. This set looks so good, no fussy lines, just good, minimal design, typically German in fact. The R41 demands respect, best for those with tough beards and experienced safety razor users. The brush is very luxurious indeed, it benefits from exceptionally soft real badger hair. Brush, Silvertip badger hair - the finest grade. Brush handle, razor and stand, metal alloy with shiny chrome plating.